The 1956 flood is the most extensive recorded in South Australia since European settlement. Months of heavy rainfall in the eastern states resulted in a massive volume of water surging through the Murray-Darling system, culminating in vast flooding in South Australia. By the time the high water swept through the Riverland area of South Australia causing considerable damage, the people living in the lower reaches of the Murray River were alerted to the pending catastrophe. Desperately filling wheat bags with sand to build levee banks to restrict the flooding, the residents of Mannum were drawn together in a unified work force, augmented by city volunteers, to try and save the town of Mannum from the ravishes of the flood. 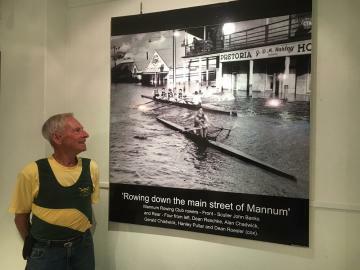 Local rower, John Banks recalls purchasing his first scull at the beginning of 1956 and when the waters rose, he would train along Burman’s Dairy in the backwaters at Mannum. “As the floodwaters got higher we had to take all the boats out of the Rowing Club and would launch near the Pretoria for our training”. “We trained 3 to 4 days a week back then and went from the Pretoria to Hermann Gass Bird Sanctuary near the Caravan Park”. “The Manager of the Bank of Adelaide used to moor his boat outside and during one training session the breeze moved it out into the middle of the main street flood waters. I tried to stop but couldn’t, once my oar went in, so did I to the amusement of the onlookers and my embarrassment”. 60 years on, the exhibition at the Mannum Dock Museum’s Arnold Gallery displays photos taken at that time in Mannum, Blanchetown, Swan Reach and Cadell. The 1956 flood exhibition shows the viewer the extent of the water inundation, the camaraderie of the people and the graphic reality of ‘the mess’. The effects of ‘The Flood’ still live strongly in the memories of many including Palmer resident Laurel Anderson. “I can remember the water lapping the top floor and verandah of the bottom hotel and rowing our wooden boat up the main street”, said Laurel. “My late husband Eric’s most memorable memory was when he saw a complete shack flow past him down the river”. “At one moment the bottom-half was up and the next the roof was up as the house tumbling down the river”. Overall more than 80 homes and 37 businesses were directly affected. On September 21 it was reported that the river had dropped seven inches in the past week; with the level now at 124.1 feet it seemed that the immediate flood crises was past. The massive clean-up of Randell Street began on November 30 when the river dropped to 119 feet. On January 11th it was published that Mannum's main street was free of floodwaters for the first time in four months. The 60th Anniversary of the 1956 Flood exhibition is on at the Arnold Gallery at the Mannum Dock Museum 6 Randell Street Mannum until the end of October. The Mannum Dock Museum is open 7 days a week with entry $7.50 per person and concession $5.00. For further information contact the Mannum Visitor Information Centre on 85691303 or visit www.mannum.org.au.